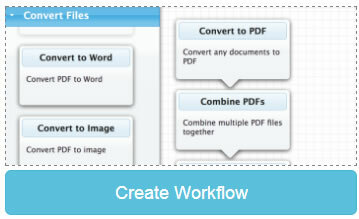 Easy-to-use PDF Cloud solution to build PDF applications. No programming is needed. After you sign-in to easypdfcloud.com, select "Create Workflow." If you don't have an account, you can create it for free. From under "Convert Files", select what document format you want to create from. Then from under "Edit PDF Files," select how you want to edit or process your document. Finally, give your PDF App a name and click "Done". This new workflow app will appear whenever you login to easyPDFcloud. Just drop a file in there or, if you are using a smartphone, take a picture of your document. It’s that easy. If you are a developer and want to integrate this PDF workflow app into your own application, you can do so using REST API. Try it now and have your very own PDF App in minutes. BCL's PDF Conversion programming interface (API) now runs on Linux, enabling Linux and Mac OS X developers to convert PDF to Word/Excel and HTML formats from on-premise software and software-as-a-service. Explore the Getting Started Manual and Sample Code for more information.